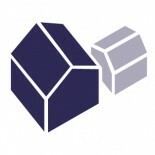 Throughout the past year, the city of Berkeley, CA has been considering changes to the city’s zoning code that would facilitate the permitting process for Accessory Dwelling Units (see proposed changes here). Instead of going through a difficult and expensive public hearing process, proposed ADUs that meet certain criteria would be automatically granted a permit. These changes could have a significant impact in the city by increasing the number of ADUs, and therefore caught the attention of a group of city planning masters students. Given Berkeley’s long history of citizen activism and engagement in planning issues, we were curious about the public’s perception of ADUs and whether secondary units could be a potential source of less contentious housing than the larger developments currently being proposed. We began by asking the following question: Does the presence of Accessory Dwelling Units (ADUs) on a given neighborhood block change a resident’s perception of density in North Berkeley? Our hypothesis, put simply, was that the number of ADUs on a block would have no effect on the perceived density. Our strategy to answer this question was to find an area of the city where we could survey residents of blocks that were as similar as possible except for the number of ADUs. Importantly, we used a non-standard definition of ADU for our study, in that we only examined detached units. While ADUs can also be built within, or attached to primary units, we only studied detached units to reduce potential error. In Berkeley, where duplexes and triplexes are common, it would be very difficult to determine whether a unit was accessory or primary purely from the exterior. In order to formulate the best guess as to the total number of detached ADUs in the area (both permitted and unpermitted), we complemented data from the city’s planning department with GIS data, satellite imagery analysis, and in-person field observations. After selecting six blocks to study, we divided them into three categories: low (0-4 ADUs), medium (5-7), and high number of ADUS (8+). We then distributed 30 surveys to randomly selected households on each blocks, and received 49 responses. The surveys contained a wide-range of questions about the resident’s background information, qualities about their neighborhood, and their familiarity and opinions regarding ADUs. The vast majority selected positive adjectives to describe their neighborhood, but most said parking was insufficient and difficult to find. The majority were familiar with the term ADU, and about 20% had an ADU on their property. A majority agreed that ADUs are an unobtrusive way to increase density and most respondents disagreed when asked if ADUs disrupt the character of their neighborhood. However, while most respondents said that more housing should be built in the San Francisco Bay Area and throughout the city of Berkeley, only very few respondents supported additional housing in their neighborhood. Overall, these results were fairly consistent and very encouraging for the proposed ADU legislation, especially considering how divisive housing issues can be in Berkeley. However, answering our initial research question required further investigation of the survey data, as well as comparing to data collected from the US Census and the American Community Survey (ACS). In addition to having data to compare against the survey respondent’s background information, we also knew how many housing units and how many residents lived on each block. Despite the wealth of information that we had about the area and the survey respondents, we only used two main criteria to evaluate our hypothesis. The first was to compare the actual versus estimated number of units and residents on each block and compare the differences across the three groups (low, medium, and high number of ADUs). The second was to compare how residents of each block answered questions about whether they felt their block was crowded, and whether it had become more crowded since they first moved there. 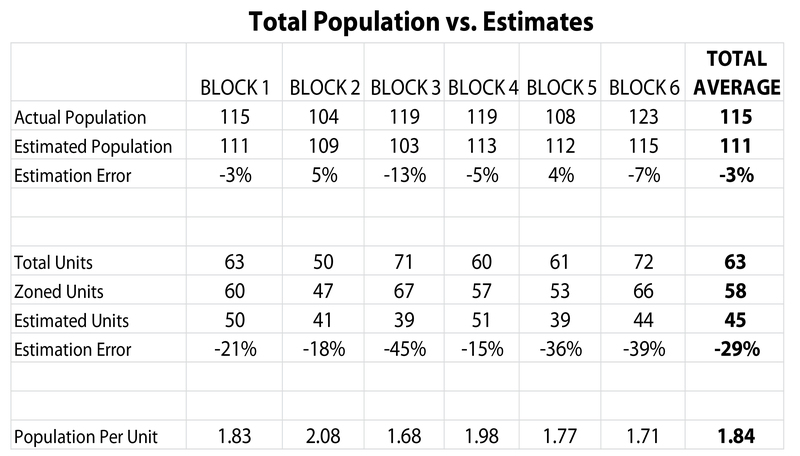 After averaging the responses from each block, we found that residents had fairly accurate estimates of the number of people on each block (most blocks were within 5%). The blocks containing high numbers of ADUs were no more or less likely to overestimate the amount of residents on their block. Residents were less accurate in estimating the amount of housing units on their blocks. All together they underestimated the number of units by 30%. The blocks with the highest numbers of ADUs were slightly more likely to underestimate the number of units on their blocks. This criteria reinforced our hypothesis that there would be no correlation between the number of ADUs and how density would be perceived. The second criteria proved a little more complicated. When comparing the perceptions of crowdedness on each block, we found a slight correlation with the number of ADUs on the block. This correlation, however, is likely inconclusive. The graph below shows the mean answers of how strongly residents agreed with statements that their block was crowded (blue triangle) and that their block had become more crowded during their tenure (red triangle) on a scale of -4 (strongly disagree) to 4 (strongly agree). The blue and orange bars show the 90% confidence intervals for these averages; in other words, based on the data from the survey, we are 90% sure that the actual, not sampled, mean for the neighborhood lies within that range. The intervals are relatively large which shows that we had wide-ranging answers across all the groups. While their was a correlation between ADUs and perception of density in our survey sample, it would be very difficult to claim that this is a definitively representative sample of the area as a whole. When we investigated further, we found further evidence that is correlation is likely inconclusive as the different groups (low, medium, and high) did not answer uniformly. The graph below compares the answers across the 3 categories (low, medium, high) to the answers across the 6 blocks. We speculate that other factors beside the number of ADUs may have influenced the answer to this question. Blocks 3 and 6, the two blocks perceived to be the most crowded, contain a higher proportion of multifamily units and a total greater number of units than the other blocks. The correlation between ADUs and perceptions of crowdedness was not statistically significant (using a t-test and 90% confidence intervals). However, the absence of a significant effect doesn’t mean there is no effect. Though statistically inconclusive, it would seems that ADUs, at worst, would have a slight impact of these variables. Correlation does not indicate causation, and more further research would need to be done to prove whether this relationship is caused specifically by higher numbers of ADUs or whether this relationship is caused by a variable we did not control for. While our research question could not be answered conclusively, many of the results either supported our hypothesis or were inconclusive. Looking across the entire survey, the number of ADUs on a given block was one of the poorest indicators of how someone would answer the other questions. We did have two other conclusions we could draw from the data, that could help the city council predict how much support their proposed legislation would have. Firstly, when comparing our survey responses to our overall neighborhood data, we found a huge discrepancy in the number of renters. Only 12% of survey responses came from renters, even though they make up 58% of the neighborhood. Renters were much more likely to view ADUs positively, and much less likely to describe the neighborhood as crowded. Additionally, renters were the only group that supported additional housing within the neighborhood in addition to city and region wide. A more representative survey of the neighborhood may have produced very different results, including an even more positive perception of ADUs. The second major finding was how dominant parking issues can be in the neighborhood. Respondents who relied exclusively on street parking were much more likely to state that their block had become more crowded during their tenure. Our survey, however, again undercounted the number of residents in the area that don’t drive. Only one respondent didn’t own a car. This is too small of a sample size to extrapolate any design recommendations. However, given the sensitivity of parking within the area, we would expect this to be the only possible source of contention with the proposed legislation, since it abolishes parking requirements for ADUs within a quarter mile of a transit stop. We suggest further research be carried out that builds upon our report and can better address some of the potential sources of error we encountered. Larger sample sizes and more representative surveys would allow more a more sophisticated statistical analysis to be carried out. In spite of the limitations of our study, we shared our results with the Berkeley city council, and remain optimistic that the proposed legislation maintains popular support as it continues to be debated! If you have any questions about our survey or our results, please reach out to us at northberkeleysurvey@gmail.com. This entry was posted on August 3, 2015 by aibenejam in Policy & Trends and tagged accessory dwelling unit, berkeley, california, crowding, research.